And no, I'm not going to call him Eggman. Dreamcast adventures as they appear in the upcoming Sonic Generations. 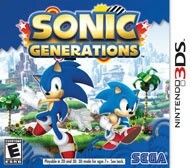 Sega isn’t talking about who Sonic will be battling in Sonic Generations. Really? Who do they think they’re fooling? in the console version of the game. alongside the City Escape zone (pictured). See some of the game in action in the newest trailer for Sega's upcoming title. We got our hands on Sega's recent attempt to satisfy fans of both old school and modern Sonic titles, and it's a dream come true so far.